IMF Dodges on Sri Lanka as Defense Spending Climbs 30%, "Stealth Militarization"
The IMF has since been ducking questions about its program in Sri Lanka, declining to answer questions submitted during and after its biweekly media briefings, most recently this year on January 12 and January 26. Inner City Press first asked the IMF about Sri Lanka in Mrach 2009, when spokesman David Hawley saying the IMF would support the government's priority. Since then, despite some answer on other countries, the IMF has stonewalled on Sri Lanka. When asked for the data behind this claim, the IMF produced a chart, about which Inner City Press has asked the IMF for comment -- so far, there has been none -- and which is now being placed online here. "much of the so called 'reconstruction' work the Government is conducting in the north and the east – no doubt under non military budget headings – is actually a form of militarization by stealth. Our contacts in the north talk of the creeping infiltration of the military into every aspect of civilian life – and that in the Vanni area soldiers now form one third of the population. A non exhaustive list of industries the military is involved in would include: construction, fruit production, whale watching, fishing, hotels, management of the three largest cricket stadiums, pedalo hire, and transport. This militarization is doing untold damage to Sri Lankan society and rapidly undermining the primacy of the civilian state. The IMF demanded a cut in the defense budget and instead the Government of Sri Lanka increased defense spending by 30%. This demands firm action." But what action will the IMF take? So far, it has been unwilling to even answer questions. 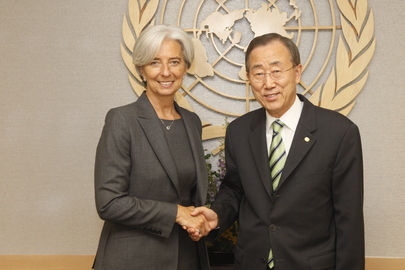 IMF's Lagarde & UN's Ban Ki-moon, supporting militarized Sri Lanka? Inner City Press: last week when on this issue of Shavendra Silva being made an adviser, senior adviser on peacekeeping. You’d said, this is up to Member States, ask the Member States, don’t ask me. I wonder if you could just simply explain the difference in the case of Syria. I did see the statement and I know it is a very high-profile issue, but it doesn’t seem that the Secretary-General has a position that he doesn’t speak out when he thinks that something done by Member States makes the UN, well either weakens the Security Council or is bad in the world. So I wonder, is it a choice in the case of having an accused war criminal advising him on peacekeeping? How can it be that in this case it is entirely up to Member States and there is no ability to say anything, and in the other case there is an ability to say something? Can you explain that? Spokesperson Nesirky: Yes, I can. Spokesperson: Because there is a General Assembly resolution which instructs explicitly the Secretary-General to do something and for the Member States to do something. That is very different from what was happening in the Security Council on Saturday. Spokesperson: I think you know how it works. We’ve been through this a number of times and it is quite clear that it was for the Secretary-General to select five eminent individuals and for the rest of that advisory group to be drawn from the different components, including from the Asia group. And that was for them to do. That’s what they did and that’s the outcome. Inner City Press: But does he think it makes the UN, in the same way that he commented on the Security Council action, somehow undermining some organ of the UN? Does he think it makes the UN look good to have an individual named in his report advise him on peacekeeping? Spokesperson: Again, as I say, the General Assembly resolution was quite explicit about what needed to happen in selecting the individuals for that advisory group, and it was for the different regional groups to decide, and that’s what they did.